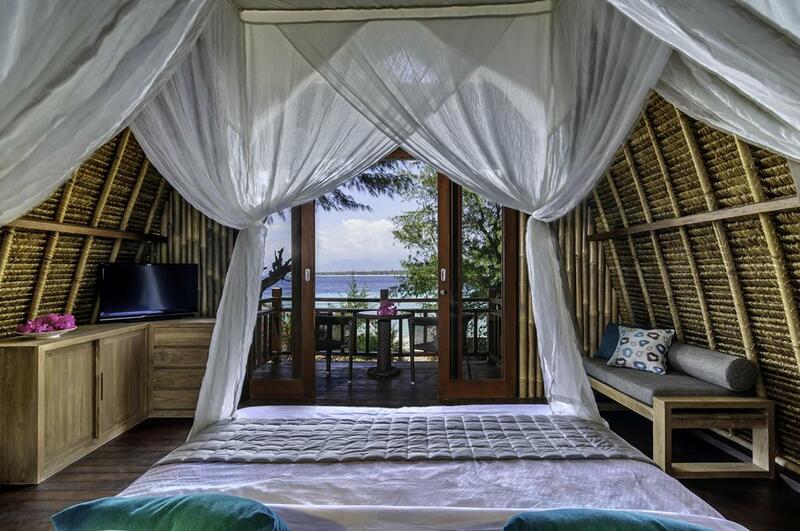 Barefoot Luxury Resort, located on an idyllic island. 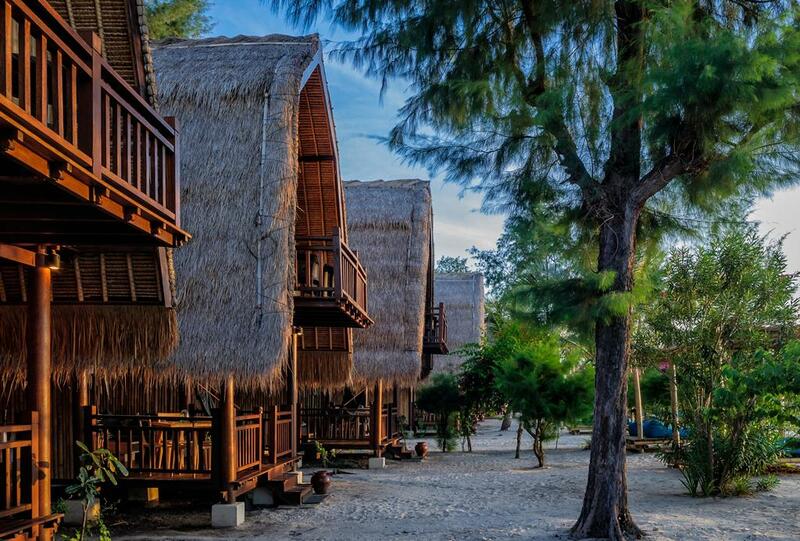 Gili Meno is the most charming and untouched of the three Gili Islands, making it perfect for couples or families looking for nature and romance far away from the hustle and bustle of Bali. Our guests enjoy exclusive access to – whisper it – a secret beach, where you can indulge in blissful spa treatments, feast on freshly caught seafood, or kick back with a cocktail in hand. When the day’s adventures are over, stroll barefoot to your beautiful beachfront bungalow or luxurious safari tent, for a romantic starlit night suffused with Utopian decadence. 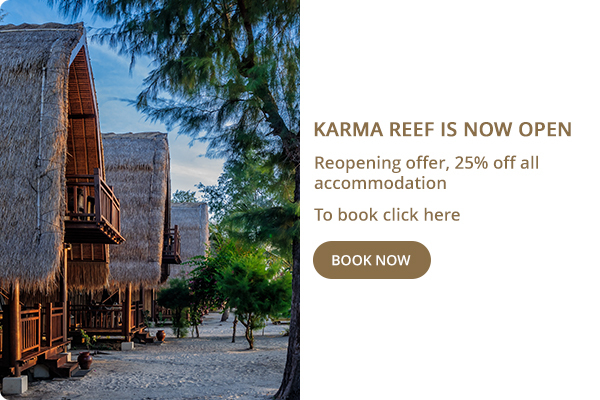 Enjoy exclusive benefits when you book directly with Karma Reef. Stay for 3 nights and choose one of these perks for a maximum of 2 people, 60 minute Karma Massage, Romantic Dinner or a 2.5 hours Private Snorkelling Tour. 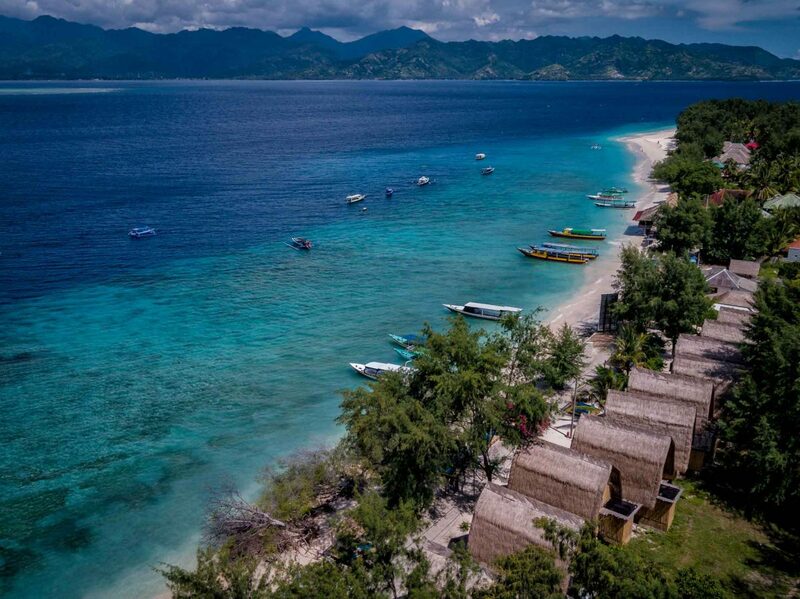 Just off the northwest coast of Lombok, Gili Meno is located on the most untouched, charming and tiniest of the three Gili Islands. It boasts the most beautiful beaches, with secluded white sands, crystal-clear waters and colourful corals. The ultimate in barefoot luxury, Karma Reef offers an utterly unforgettable setting in which to relax and recharge. There’s still plenty to entice explorers away from their hammocks: horseback riding, a turtle sanctuary, world class diving, snorkeling and island-hopping boat trips are all nearby, waiting to be discovered. If you arrive at Praya International Airport(LOP), we can arrange to have you picked up in our air-conditioned car and transferred via speedboat to Gili Meno. The journey is less than 2 hours by car and approximately 15 minutes by private speedboat. The price for up to 4 persons is US$100 one way. This option is also available after sunset when all public boats have stopped operating. Wake up to the sound of the sea, in the sumptuous surroundings of your bungalow or tent, and ease yourself slowly into another perfect day in paradise. Spa treatments on the sands, signature cocktails at the Tiki Bar or a private candlelit dinner-for-two: however you choose to while away your lazy, hazy hours at Karma Reef, we'll make sure it's a truly special experience. The dress code? No shoes required! Lazing on a Sunday afternoon, Karma-style: live music will provide the perfect backdrop as you chill out over cocktails and light bites at the Tiki Bar. From wood-fired pizzas to freshly caught lobster: take your pick from the delicious Indonesian-inspired and Mediterranean-meets-New-World dishes at our laid-back beachside restaurant. And to drink? Make your selection from our signature cocktails and fine wines from around the globe. Why drag yourself away from the beach? 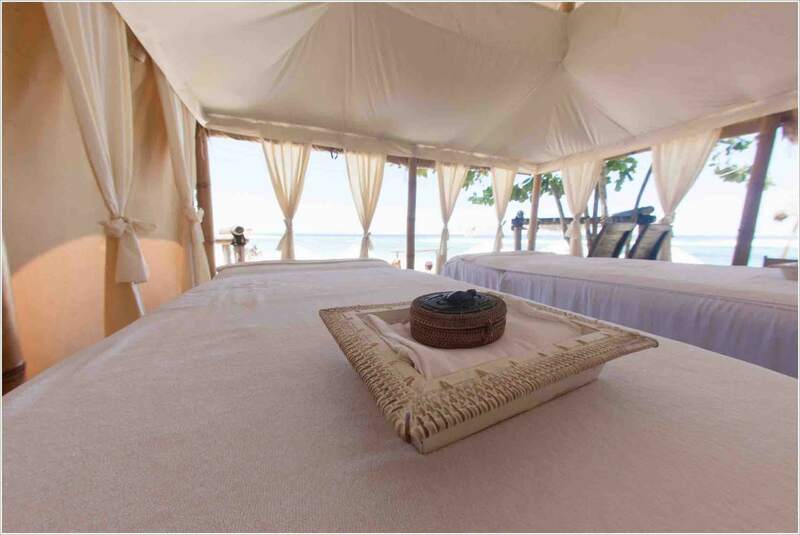 Our spa tent is right on the sands, so you can feel that seductive sea breeze and listen to the gentle ocean while you indulge in a beauty treatment or massage from our expert therapists. All our botanical spa products are 100% sustainable and ethically sourced. At Karma Reef we offer complimentary snorkelling equipment and bicycles to help you explore this magical island. If you’re looking for a little underwater excitement, scuba diving is available with our local partners, they will help you to explore some of the best underwater sea life that Indonesia has to offer. Our concierge team are also on hand, to assist with guided snorkelling trips with local boatmen who know the best spots or explore the Island by horseback, choose your time and let us take care of the rest. We also provide paddle boards & sea kayaks for the more adventurous guests. Karma Reef has partnered with Blue Marlin Dive Centre, metres away from the resort. This PADI certified dive centre has been operating on Gili Meno since 2001 and offers everything you could possibly want, from; introduction dives, fun dives, deep dives, wreck dives, PADI open water certification all the way up to dive master. Our team at Karma reservations offer you the opportunity to book your preferred dive prior to arriving on Gili Meno, to ensure you don’t miss out on your preferred time to dive. “Every time I slip into the ocean, it’s like going home.” – Sylvia Earle. 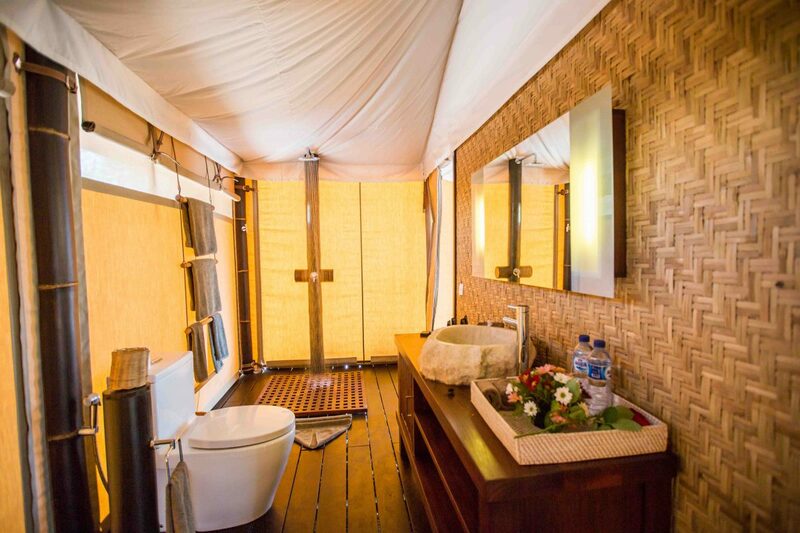 Treat yourself to a taste of bohemian barefoot luxury in one of Karma Reef’s One bedroom Sea View Tents. Enjoy all the benefits of Gili Meno’s stunning natural beauty, paired with heavenly creature comforts that you would expect from Karma. 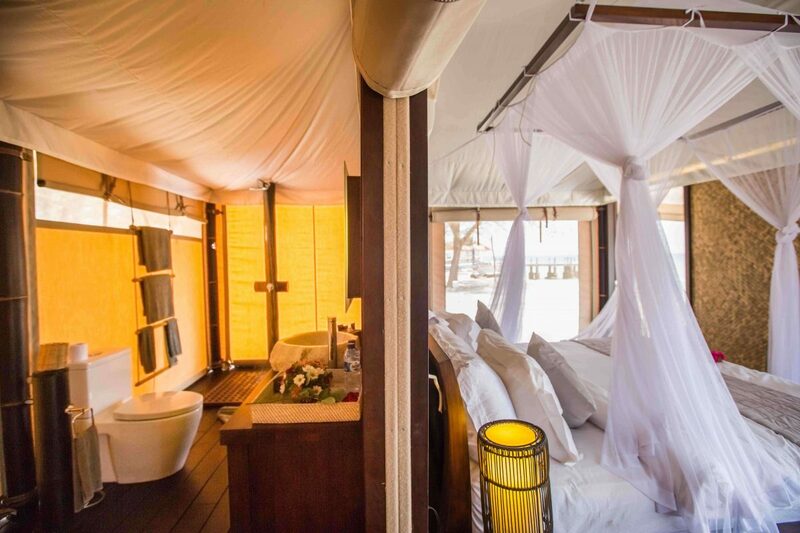 Experience holiday bliss with a plush king-size bed, air conditioning or fan, en-suite bathroom with hot water rain shower, wooden floors throughout, private open-air terrace and a unique ambiance that is exclusive to Karma Reef. Treat yourself to an upgraded location in one of our One bedroom Seafront Tents. These stunning duplex style Seafront Bungalows, offer the resort’s finest location, with sea views from your terrace or whilst laying in your plush king-size bed. 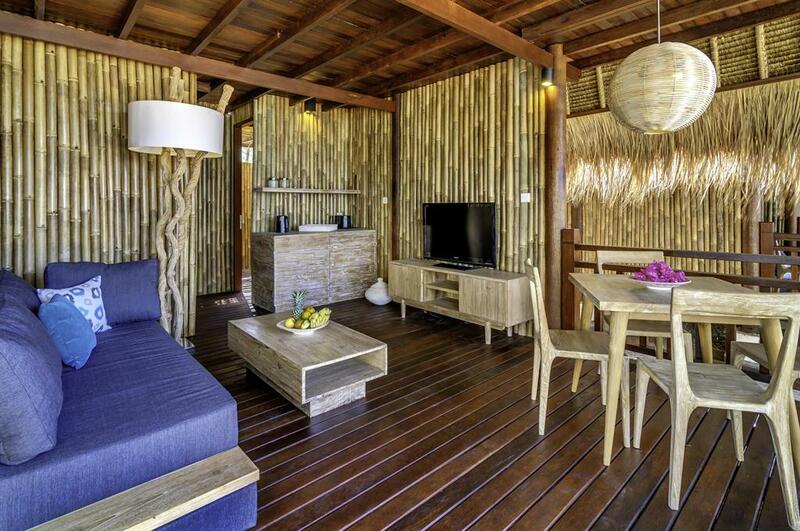 With all the Karma creature comforts such as air conditioning, fan, en-suite bathroom with a rain shower, wooden floors throughout, private open-air terrace and a unique ambiance that is exclusive to Karma Reef. Dining at Karma Reef is precisely in keeping with the ambience of the resort: laid-back , local and inventive. Dine with your feet in the sand, at our beachside restaurant for breakfast, lunch or dinner. Start the day with breakfast in your bungalow or tent, or let us organise a special private romantic candlelit dinner. Each day will bring a new surprise with Seafood BBQ’s, Traditional Indonesian menus and even wood-fired pizzas are available. Our chefs work their magic to source the freshest local ingredients to conjure up imaginative menus for your dining pleasure. 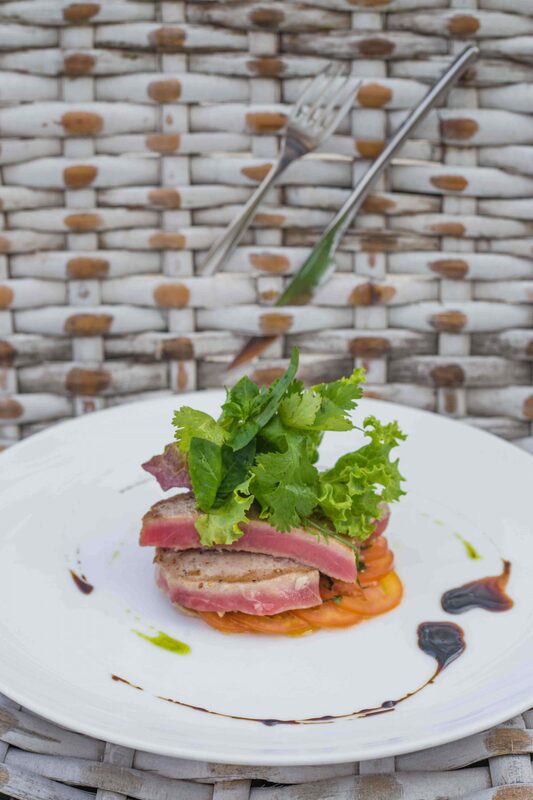 With Mediterranean and Asian specialty inspired favourites, Seafood BBQ nights, Traditional Indonesian menus and a mouthwatering assortment of wood-fired pizzas. 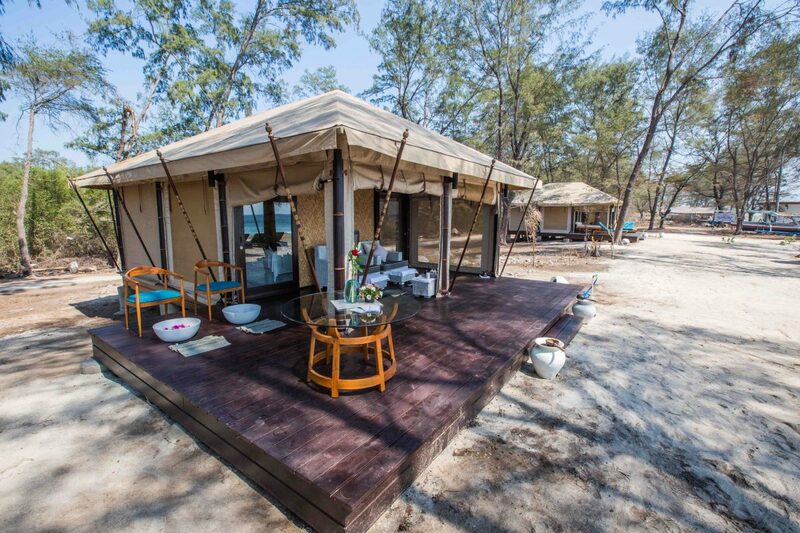 There is nothing that you will be left wanting whilst staying at Karma Reef. Say ‘I do’ on our secret beach at this idyllic island hideaway. Let our experienced wedding coordinators help you create this once in a lifetime moment. With the resort being so intimate with only 14 Bungalows and Sea Tents why not book this exclusively for you, your family and friends. Immerse yourself in Karma Reef's Easter Extravaganza, a fun-filled journey for the entire family. 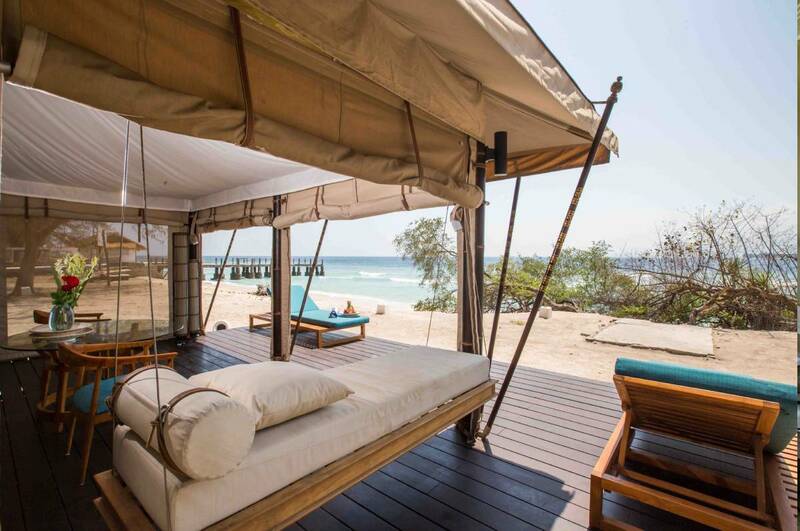 A luxurious resort on the tiny, traffic-free island paradise of Gili Meno, Karma Reef offers sanctuary – a world away from the noise and demands of everyday life.